Teil 1: The space matrix is explained and presented. I originally was only interested in the medium, the fabric on which field theory is based. I had a geometric structure in mind, which I wanted to test in terms of field theory. Surprisingly, this geometry showed me that virtually all physical questions are explained by mere Platonic thinking. However, it changed the old paradigms. From the prospect of physics, a new theory with new paradigms should make no sense, especially if the new values do not alter the old ones. The matrix-field theory (MFT) does not show any new mathematical solutions for predicting experimental values, but the interpretation of these values changed surprisingly and radically. When I read Rodney A. Brook's book "Fields of Color," an excellent book on Julian Schwinger's Quantum Field Theory, I realized that he had completely tied his theory to existing physical values. Instead of particles he said fields and actually improved the existing physics only with a new angle of view. On the other hand, the theory of a geometrical matrix, what is presented here, seeks to reinterpret the paradigms themselves in order to see what new insights arise from them. The pure logic itself should guide us, not the stamp collection of physics, the vast sea of experiments and lists. We should finally wake up. A look into future requires a completely different view of physics. It is a matter of time when explanations become necessary when we see missiles that accelerate from zero to 10'000 km/h without a gravitational pull and without inertia becomes deadly. Pulse by the resistance to leave the original state. Field theory has the advantage that it is from the beginning a GUT (General Unified Theory) and all further determinations from this point are like the branches from the trunk, while classical science is a mix of experimental results and the search for theoretical affiliations what often leads to different theories. The classical science thus has many planting sites, which then it tries to unite in a trunk. The recognition of MFT would not overturn physics, but the picture of the physical world would fundamentally change. The excitement is that by the geometry of field space, its specific cycles in at least 4 spatial-dimensionens and its field tension, the extremely difficult to imagine things such as fermions, bosons, mass, inertia, gravity, etc. can be explained. Space It is not real without time and pulse. … it is without distance and size. Time: It is unimaginable without space and pulse. … is timeless without size. Pulse: It is not real without space and time. … a point size in zero time. Mathematically, they are used separately but always form a continuum. Einstein only used the space-time continuum, because he built his theory on the constant speed of light and speed is defined only by time and space. Later he was persuaded by Schwinger to integrate the pulse into the field theory instead of energy. It was obviously too late for him (he died a year later). In his self-formulated field theory, which he was using to explain gravity, he spoke of space curvature, an irritating thought that is still be present in the conceptions to this day. Thinking about axioms of space-time-pulse as concepts of our consciousness does not bring us to reality, what it is all about in physics. Space only becomes real if it consists real space particles. 1, 2 or 3 dimensional shapes are only tools of our intelligence, but not physically real. The zero-dimension must therefore be physically real. There lies the heart of matter. It is the smallest size that cannot be measured in any way. Although it is not exist in physical sense, it must have physical values. A world dimension of the zero dimension must be able to fit into the 1st. 2.; 3. or multiple dimension. 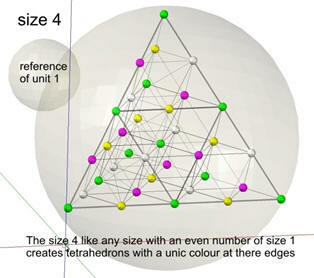 The recognition of this fact leads to the conclusion that the third dimension must be able to multiply into the fourth and this into further dimensions. Time only becomes real if it consists of time cycles. A smallest time cycle is recognized as real when measured from a larger cycle. In the cycle itself, time is just a concept. Like space, which can develop in all directions, time can also go forward and backward. This sounds amazing, but logically fulfills the rule of the continuum of smallest particle. The sum of all axiomatic values must be zero if describes the "empty" space without to explode in universal scale. In Feynman graphs, this is freely applied today in experimental physics, but without being explained. In addition, a cycle would not be a cycle if its values do not complement each other and sum up to zero. Pulse is the most mysterious component that characterizes the fabric of our world. The space-time becomes the real continuum only through the concept of pulse. After all, it is the resistance that makes the events in our world real. It is the tendency of the material of our world to return to the harmonious state after a disturbance. It is the reason of Planck's constant h (h = energy / frequency). This is basically a moment (pulse x wavelength). The moment, on the other hand, is the elasticity. It is the elasticity of a field that defends itself against the compression / depression phase. Now I announced the magic word "Field" The field described by Einstein and Schwinger in their relative "Quantum Field Theory" (QFT) is basically the same thing that needs to be rethought in a pure Platonic way. However, it is approached from a completely different angle. It is not a matter of a mathematical description of empirical results of contemporary research, but of a philosophical and theoretical basis on which our whole world, physical and metaphysical exists. Although QFT is dramatically described by the current science, they do not assume a space-time-pulse continuum. They ignore the (-) time without justification, the supersymmetry (SUSY), they consider the spin as a twist instead of a cycle and have the different theories unconnected and separately adjacent to each other. Bridges between them are mathematically very complicated if at all possible, because a common idea as the basis is missing. A common base in the description of the world should be the goal of this study. It creates paradigms that are as little known today as the solar orbit of earth in the 17th century. We are on the threshold of a new age, where we have to explain phenomena that only create new concepts with classical physics, without having common basis. Fields will substitute the compact particle and field manipulation will be called the new mechanics. This is the only way to explain gravitational control, as this is the only way to achieve accelerations from 0 to 10,000 km/h in seconds without inertia. In contrast to Quantum Field Theory (QFT) are not described the fields between two places, but the geometry of theire places. 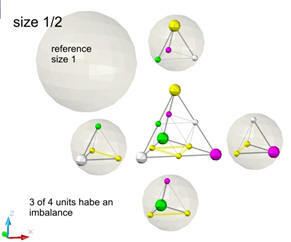 The geometry is the base of various relational networks, which leads to a better description of the subatomic states. Later, these symmetries are intended to replace today's notions of "particles" and their property fields (quantum values). Considering that today physicists see e.g. a proton as a shell filled with quarks and gluons, which becomes absurd if quarks with their field size (their Compton wave, which results from h/e) are at least 2000-3000 larger than a proton. Or Electrons are orbiting a proton (lightest atomic nucleus) at 1% of c. How should that look like, since an electron has a field size (Compton wave) which is about 1800 times larger than the one of proton. It gets even weirder if a spatial zero size is assigned to an electron, because even with the smallest wavelength nothing was found. All ideas of modern physics are still preoccupied with the idea of atoms as 100 years ago; small billiard balls in empty space. The first step to explain the structure of empty space is the answer to W H Y. The space and later the space-time-pulse (the continuum) can only become real if it consists of the smallest space cells of size zero (non-measurable) and still possess all the physical properties of the continuum. The continuum has a certain geometry, which results from the condition of filling the (theoretical) space by an optimal filling way. A plastic bag filled up with little balls of equal size, it will fill up in a way, that the center of each ball, joined by a line, creates a space of tetrahedral and octahedral. All centers are spaced by equal distances. 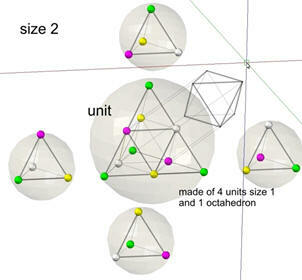 With 4 tetrahedral, a space is formed what has a gap as an octahedron in their center. It is the densest filling of the space. In our 3 dimensional world, this geometry (see below) shows that 4 states are needed to form a cycle as equilibrium. These are represented here by 4 colors (white, green, yellow, red). The other property of the matrix (structure of the continuum) is its scalability. The individual cells with their 4 states are supposed to fit together so that the neighboring structures also form equilibrium and the states there too add up to zero. However, the enlargement of the field sizes shows that space becomes new properties. Of course ether is not the right term, used here only temporarily. It's packed with energy and just as static as the speed of light is constant. A movement in the sense of a space displacement is just as impossible as the flight of a fly in a diamond. So there is no movement, everything is a propagation of states. Massive matter is therefore only a state of space and moves like a sound through its medium. All of us are in this sense only spirits or moving states of the continuum. Here the limit is shown to the greatest minds of physics with their giant hadron colliders like CERN. Even the smallest particles cannot move, only propagate or "develop" in space (diamond). 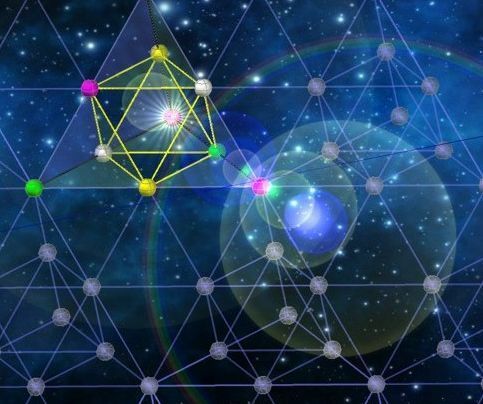 There are innumerable other reasons why space, as the zero sum of all properties, cannot have any structure other than the network of tetrahedral and octahedral. The smallest world fields are shown here as colored spheres. The color indicates the current state and changes four times in one cycle. The scaling of space starts with the size 1. 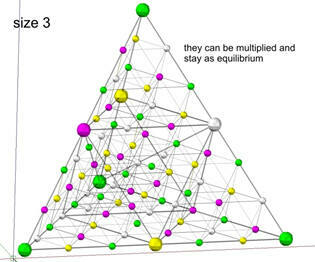 In each exchange equilibrium is generated, all 4 exchanges generate equilibrium again in the whole structure. 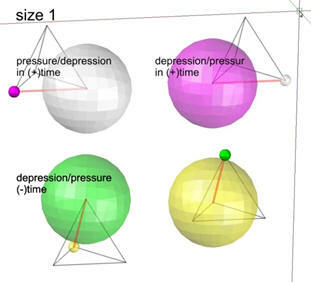 According to e = h˟ f, the field radius is small in compression and large in depression. The color combination is such that the sizes are balance out. A fermion is not an ultimate thing; it is a field that has an interaction with neighbor fields. It is not spatially isolated, does not rotate and has no movement. It is the interaction that moves. Even in a multiple application, each property (color) finds its balance in the neighboring field. The cycle includes 4 states of the space-force continuum but only 2 states of time. This circumstance seduced the physicists to assign a torsion (spin) or helicity (left / right) to fermions. As long as today's physics don´t accept (-) time and super symmetry and the fact of field oscillation, they have to invent a new physical state as a quantum number, another unnecessary primary attribute. The topic will be discussed later in more detail. The next size is twice the field distance of 1. 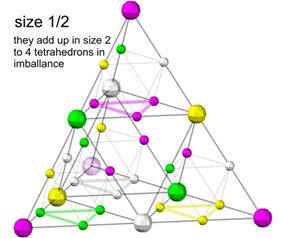 It is a tetrahedron formed by 4 tetrahedral and a size 1 octahedron. 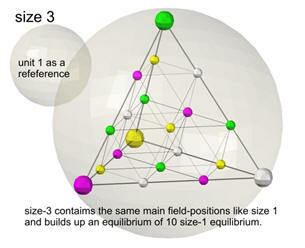 The vibrational states of the (size 1) tetrahedral are staggered over time to form an equilibrium in and of themselves. 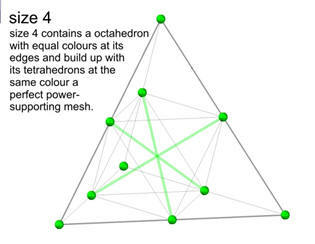 The 4 size 1 tetrahedra form as a convolute a tetrahedron of the same color (here green). This changes space as a force-transmitting structure. Vibrations can not be kept in space 2, they spread out. 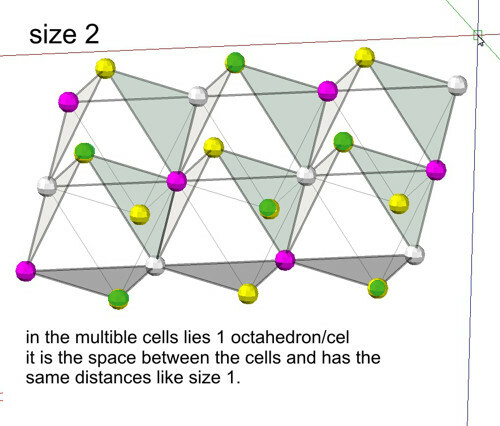 The internal distances of the (2) tetrahedral make (1) octahedron, which shows a new way of the force transmission. 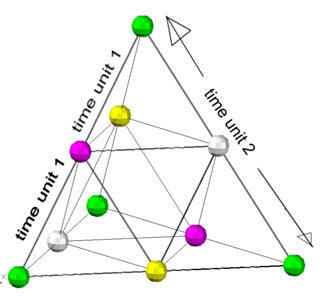 The diagonals of the octahedral yield a line of equal colors that form a new orthogonal space structure (size √2) in the sympathetic coordinates x-y-z. At the intersection of the 3 coordinates, a “manko color" is created, the missing fourth color of the corners ones. The space of size 2 seems to have an ideal force transferring structure in which fields propagate with C, unlike fermions, which can not have velocity of C.
The oscillation 3 consists of 10 tetrahedral of the oscillation 1 with the internal distances of 4 octahedrons of size 1. 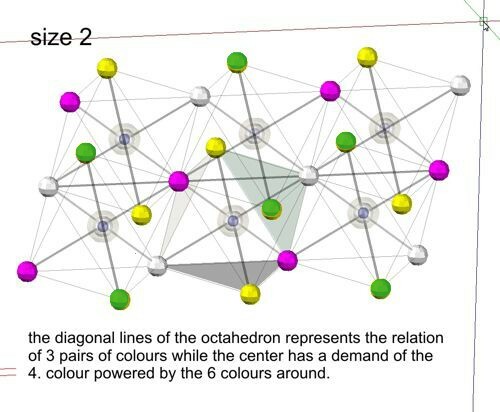 In the center of the octahedron are again the color deficiencies (color shortcoming), where again among each other create a size (1) tetrahedral in equilibrium (color balance) unable to transmitt any pulse. The hier in size 3 depicted octahedra (size 1) have inside in there center the color shortcoming of size 3√2. 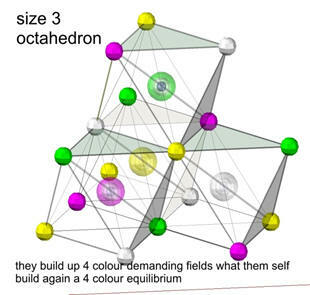 These 4 octahedra have the size 1 and 4 different colors in their center, which in turn form again an equilibrium. Therefore, their ability to transmit power on this scale (3) can´t used. The multiple recording of the structure with oscillation of size 3 consistently shows a homogeneous color balance of the 4 states. Fields of size 3 remain local, suggesting that fermions can only be in the field sizes of odd number series (3-5-7-9 ....). This does not mean that these field sizes can explain baryonic matter in geometric manner. The geometry of the space matrix shown here does not allow field properties such as mass and inertia. In these sizes of space are only the properties (in the 4 colors) involved, which define the electro-magnetic space (EMR) of classical physics (space-time-force). In the context of an effect of further spatial dimensions, mass / gravity will be later specifically discussed. Field distance 4 again shows the same space property as size 2. It is a structure that transmitts all disturbances with C in the field size range of even numbers (2-4-6-8, etc.). 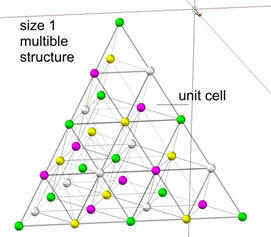 In the field size range of the odd numbers, however, all disturbances in the equilibrium of space cells size 1, 3, 5, etc. are compensated. 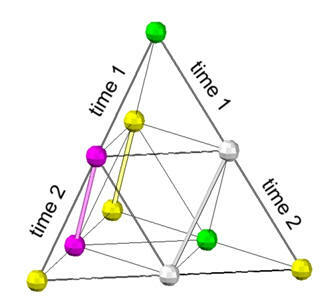 However, in contrast to size 2, the field distance 4 has the same colors also in the octahedron structure and offers a triangular and orthogonal space of the same color. It is a space that has the same periodicity through and through and therefore the best resonance. It is the space of light. The extrapolation of this idea leads us to the realization that the larger the field spacing of even numbers, the purer is its structure with respect to the periodicity of the same colors. At the same time, the "purity" of the structure of the large field sizes of odd numbers becomes will always stay in color balance (which means changing colors or inequality of colors.) The spatial structure seems to evolve for two different tasks for the optimal impulse transport and the compensating colors for the preservation of the locality in standing fields. 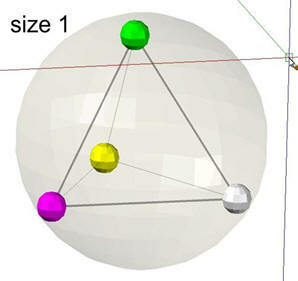 The center of the space size 4 (theoretically here as metric 4) is now no deficiency color of the internal octahedron, but is surrounded of 6 of the same colors and receives a surplus of 3 √2, which may indicate the condition of W and Z bosons. What does it look like if the disturbances of harmony are so great that the structure of space collapses? As long the theory of spatial properties is not tested on physical reality, we should continue to complete the theory in a purely theoretical sense. A 9 to 8 collapse is probably to be an explosion. In any case, it will be very short and unstable, since the disturbances or forces will spread with C from size 9 to size 8. A collapse from 9 to 7 would be conceivable. For example: when a white dwarf explodes to become a neutron star. The structure 9 falls through the structure 8 (phase of the explosion) in the structure 7, where it is stable again. But what happens if the field size 1 collapses. Can the black hole be found here? It is the question of the medium on which all fields are built. Is it Planck's size? In the matrix field theory (MFT) it has no function and is irrelevant. However, a medium should be defined, otherwise everything is just theory. All fields described here are based on smaller fields that serve the purpose of a medium. The medium is therefore a scalar variable with its own metric. However, the conditions change when changing the field sizes. This forces us to pay attention to higher-level structures. Field size 1 has the clearest definition of equilibrium. All field sizes of odd number obtain the equilibrium. The field size 2, on the other hand, has a force-transmitting structure, which becomes more "clean" in the field sizes 4 and all the even numbers. If we had to play God to create a universe, then size 1 would be chosen as the base for baryons and size 2 as the base for bosons. Normal matter fields or EM fields could collapse many times until they reach size 1. But what will becomes about field sizes <1? Ich zeige hier die Feldgrößen ½ und ¼ auf, um zu sehen, wie sich die Raumeigenschaften dort zeigen. Grösse ½ hat 3 Tetraeder mit Farbmanko und 1 Tetraeder als Equilibrium. Im Inneren erzeugt der Abstand der Tetraeder ein Oktaeder mit 4 Farben, die jedoch kein Equilibrium bilden. Die multiple Anwendung erzeugt eine Raumstruktur, die mit dem Farbmanko der Grösse 1/2 wieder ein 4 Farben-Equilibrium bildet. Umgekehrt werden Bosonen (Photonen sind wahrscheinlich nicht mehr möglich) wahrscheinlich von den Nachbarfeldern eingefangen und können nicht propagieren. 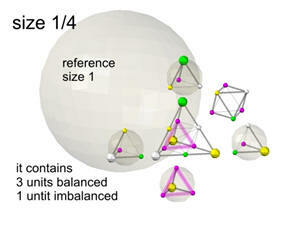 The field size ¼ shows a similarly problematic spatial structure as size ½. However, the ratio of "impurity" is reversed here. It has 3 units as Equilibrium and only one unit with a deficiency color. At this size, fermions become somewhat more stable, which is likely to last only pica seconds. When reducing the field distances of 1 / x, it is assumed that the field forces increase proportionally, deviating more and more from equilibrium. A potential collapse into a black hole would fall from magnitude to magnitude to some what stabilization. The energy becomes a plasma-shaped energy ball. But a singularity can´t be achieved. Since the scenario takes place completely in 3D space, no rest mass could actually attained, as it will become clear later on with the inclusion of the fourth space dimension. Since the scenario takes place completely in 3D space, no rest mass would actually arise, as it will become clear later with the inclusion of the fourth space dimension. 2. the odd-numbered distances with unequal colors. In the first type of space, all forces (disturbance of balance or equilibrium) are radiated with c, the second space size attempts to balance all forces, so that their source of disturbance has to be renewed again and again to stay locally. With a side view of the physical space, there is the space size of the fermions, which is separated at each new space size of the spatial nature of the photons and bosons. That hints to a real scenario. Es muss uns immer bewusst bleiben, dass diese Raumstruktur nicht statisch ist. Sie oszilliert und interagiert mit den Nachbarfeldern mit Lichtgeschwindigkeit. Nun stellt sich die spannende Frage, ob da noch ein Gleichtakt (gleiche Frequenz der Farbwechsel) möglich ist. Wie wir sahen, ist bei der Größe 1 ein vollständiges Equilibrium, die Balance aller Farben erreicht. Größe 2 hingegen gibt dem Raum durch die lineare Anordnung gleicher Farben die Fähigkeit einer Kraft-Propagierung. Da aber die Zeit in der Geschwindigkeit c die doppelte wie die bei Größe 1 ist, so würde die Farbe bei der Ankunft der Feldwirkung gewechselt sein, so dass der Raum diese Fähigkeit einer Kraft-Propagierung verliert würde (siehe unten). In der Tat ist es so, jedoch nur bei der Grösse 2, was darauf schliessen lässt, dass im Prinzip die Raumgrösse 4 als perfekte Basis des Lichtes ist. Der Raum als Konvolut würde bei der Propagierung des Lichte eine Gleichzeitigkeit seiner Takt-Wechsel erlangen. At young age I spent the night in Florida "beachside" on the shore and looked at the multiple lights of the "Bay", which came from yachts in the otherwise calm waters of the Bay. Fascinated, I observed different wave patterns and their interferences. In doing so, I realized that several compact clusters of pattern propagated and interacted at a much higher speed than the waves. 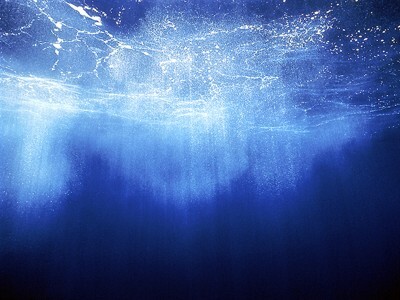 One wave creates the next, but its simultaneity was free from dynamic wave propagation in the water. Sure, that was not an entanglement in the sense of a quantum entanglement, but it showed me the idea. Space allows no movement but only propagation. The space in its smallest units becomes more and more static, according to the Planck / Einstein moment the potential energies increase into the immeasurable and thus also the inertia of the space. Since space in the scale of large fields and weak impulses has smaller fields with stronger impulses as medium and these are based on even smaller fields with even larger impulses, the substance of the field space ends in unimaginable rigidity and hardness. To emphasize: The space is unimaginably hard and rigid, in principle it is absolute and without relativity. The harmonic and perfectly systematic structure of the matrix field theory is not and cannot be a coincidence, even if it contradicts the "Copenhagen Declaration" as a physical paradigm. Our space must have started from an unimaginably dense and compact state, where only the most ideal spatial positions could be occupied by the degree of density and it has evolved as an expanding metric to today's density. However, I am not saying that the so-called Big Bang has taken place, but that the universe has a similar fluctuation as its smallest units as a matrix medium. As important as this topic is, it does not make much sense at the moment to speculate, as too many paradigms need to be clarified. Christmas 2016 I began to describe my idea of a space matrix in the web page "The Field Space". In 2017 and 2018, the ideas in my mind and my 3D CAD platform grew into a zoo of solutions that demanded a logical order. In July 2018, I started to document these ideas in a Word-File in a logical sequence with word and picture. The individual topics actually produced themselves and staggered me with their surprising solutions. I now realize that the MFT should actually need a team of partners, which of course is only a wishful thought.